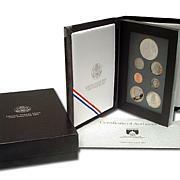 Filled with old favorites and unique commemoratives, you'll love the assortment in the 1986 Prestige Proof Set that comes in its original government packaging and includes seven coins. Proof - marvel at the mirror-like finishes on these proof coins, the result of 2 or more stampings on special polished blanks during the minting process. Because of the extra time it takes to strike each coin, only a limited number of proof copies are produced each year. Bought this set in my son's birth year as a gift and I am sure he will treasure it. The coins are stunning and the packaging is impressive. 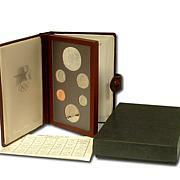 The 1986 Prestige proof set is a great addition to any collection. 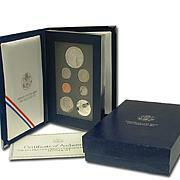 Coins, box, and all packaging in excellent shape. 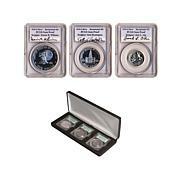 Nice coins, well packaged. Government packaging was superb, and the anniversary of Liberty a great focal point for the set.This is definitely a keeper.